Oops - we don't appear to have a video for the ScanSnap S510. I use one of these at work and it is a superb product as well as being simple to use - a one button press machine. The ability of an A4 footprint machine to do A3 scans is a real bonus. I've had the scanner for a while now, and, overall, it's well worth the money. Only one problem I've encountered, when it's cold it tends to feed two (or more) pages through at once so you need to be standing over it when scanning. While it states the scanner can handle 50 pages at a time this is dependent on the thickness of the paper. I agree with all the five star comments as to the qualities of this machine. It is truly wonderful. However, for me the first few pages of the day result in a frightful, high pitched grinding noise. I then open the scanner and remove the page and run it through again - same noise. About the fourth time through it runs perfectly. This has happened just about everyday. Other than that, the machine is GREAT. I chose this scanner as it has the most positive reviews. I ordered one and loaded all the software per the instruction. Struggled initially as I couldn't find the serial number of the Adobe Acrobat, but it was in package labelled clearly in blue. Apart from that, all went smoothly. Can't believe how tiny the scanner is just two handful. I expected it to be bigger so it was a nice surprise. The scanner is amazingly easy to use, even for idiot like me. Got mixed up intially as I scan all documents double sided, then realize I had the duplex mode on. In all, I am very happy, it is very fast, just hope it will last for a long time. No hesitation in recommending. June 08. Thank you to those write the reviews previously. Been most helpful! I bought this scanner from Tradescanners five months ago, and I've used it a great deal since then. I've been pleased with it, and with the sales support I had from Tradescanners. The scanner itself worked straight out of the box. The PDF software is very useful, pages can be inserted and deleted and moved around in the resulting PDF file, and made searchable as required, even in less common languages such as Greek. The only irritations are occasional paper misfeeds, and a tendency to cause streaking during colour scans if the inside is insufficiently clean. The scanner is not TWAIN compatible. I can't think of any advantage it would have it were TWAIN compatible, but I own a separate flatbed scanner. I'm glad I bought this one. Recommended. Excellent. Easy to use and develop a backed-up up paperless system. Highly recommeded. I love the product. I am using it for home use - the objective is to put all my historic and current filing on to my p.c. In short to have a paperless house. It appears, and is, very robust so far - I have input about 9000 sheets so far without problem. The very occasional misfeed is inevitably caused by me feeding in a sheet of paper in poor condition. It should be robust of course - just noticed the Fujitsu write up says suitable for light office use and equates that to one thousand sheets a day!! The facilities offered in terms of paper handling are excellent - different paper sizes, skewed paper or print, paper submitted upside down or sideways etc are all corrected automatically for you. I have run at slow speed which is more than enough for me - on the grounds that this was a one off exercise so I might as well input everything with the best quality. When I experimented initially the higher speeds seemed to work very well too. The software is really easy to use. Much more so than most printers for example. The facility to convert to searchable files is excellent. I only wish I could use this software on other pdf files I have that were not created by ScanSnap. It can't be that difficult for Fujitsu to enhance the software to do that? The conversion s/w to Word and Excel seems to work very well. Haven't tried PowerPoint conversion yet. Nor have I used the business card reading software. Surprisingly little paper dust builds up in the machine. I have used conventional cleaning wipes to clear the scanner up to now. The manual does say though that one should only use proprietary Fujitsu Cleaner F1. It might have been an idea to supply one of these with the scanner together with instructions as to how to re-order. I’m very satisfied with the ScanSnap S510 that we purchased. It’s very user friendly and easy to use. It also allows me to manipulate documents quickly, which will normally be very time consuming if I had to type it in. I was also very happy with the service and advice from your website and would definitely consider buying equipment from you in future. The scanner is great - small, compact and speedy. It hasn't caused me any problems when doing large documents and has been easy to use (even for a none techie). Only let down is the software for scanning business cards. It does not give you enough information from the card. It would be a fantastic all round machine if it did this more effectively. I had hoped I could create a spreadsheet from all my manager's business cards but the software seems to produce individual excel sheets rather than allowing a group of card details to be input into one sheet. So this was a real shame. It would be a wonderful upgrade if business card scanning allowed more details to be scanned into a single spreadsheet. 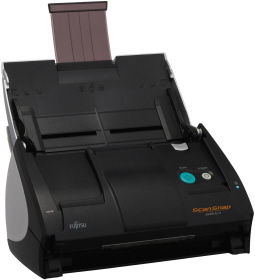 ScanSnap S510 - The Paper Manager! ScanSnap S510 now gains a Quick menu mode, just press place documents to be scanned, press the Green scan button, Quick Menu pops up allowing you to direct the resultant PDF file to a number of applications at the click of a mouse. A complete desktop solution, simply press one scanner button to convert colour or mono multi page, doubled sided documents into digital PDF files which you can file, organise, share and email. The ScanSnap software automatically creates Adobe PDF files which have become the de-facto standard for document exchange, enabling you to send documents anywhere in the world safe in the knowledge the recipient will see the document exactly as you see it. ScanSnap Organiser allows you to file,organise, email, print, OCR and browse your scanned documents without the need to open them in Acrobat, It can also convert Scansnap scanned PDF's into fully searchable PDF as a background process. ScanSnap S510 can also scan information directly into either Word, Excel or PowerPoint 2003 via OCR using the Scan2xxxx functions integrated into the ScanSnap software or Drag and drop files within ScanSnap Manager to convert to Word, Excel or PowerPoint 2003 editable documents. To make scanning as simple as possible, ScanSnap inspects each document to decide if a document should be scanned in black and white or colour, what the size of the page being scanned is and eliminate blank pages, all of which serve to speed the scanning operation and minimise your storage requirements. In addition each document will have misaligned text corrected (Auto Deskew) and each page will be have its orientation automatically adjusted. ScanSnap also includes CardMinder ver 3.1, an application which can intelligently capture the information from business cards. Cardminder now includes IntelliSync which enables the data to be exported to a number of PM applications. The underling database can be stored and exported to a variety of PIM software such as OutLook, ACT and Goldmine via the IntelliSync. Using the supplied carrier sheet provides A3 scanning capability, A3 pages are folded and placed in the carrier sheet, when scanned, Scansnap will automatically stitch the 2 (front & back) images together to recreate the full A3 image. The carrier sheet can also be used for scanning photos/documents which might be easily scratched or irregular shaped documents which are difficult to feed otherwise and may cause paper jams.